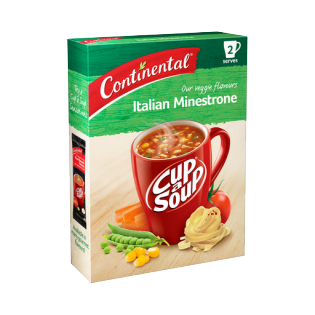 Continental's quick and easy to prepare Italian Minestrone Cup-a-Soup is blended with authentic flavours. Learn how to create this delicious dish today. Vegetables (23%) [tomato^ powder (13%), onion (pieces, powder), carrot, corn, green peas], noodles (22%) (wheat^^ flour, wheat gluten), maltodextrin, corn starch, sugar, salt, mineral salt (potassium chloride), flavour enhancers (621, 635), natural flavours, sunflower oil, parsley, natural colour (carmine). ^From responsibly grown tomatoes ^^ From responsibly grown Australian wheat. Love love love my italian minestrone soup !!! This is my absoulutE favourite cup a soup. It has so much flavour. Love it!